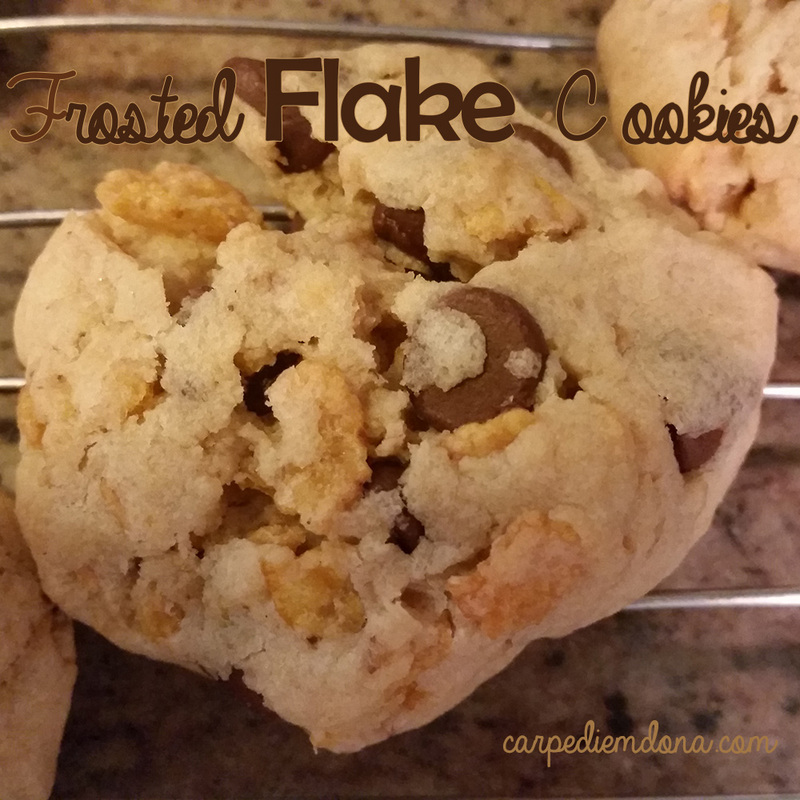 Dorothy from Crazy for Crust posted a blog the other day on Frosted Flake Cookies. She wrote about how she developed this recipe from a corn flake cookie recipe in an old recipe box. That brought back memories. My mom used to make a corn flake cookie and I remember how much I enjoyed them. Another thing I liked about this recipe is its directions follow the way I usually bake. This recipe has all the ingredients being mixed in one bowl as opposed to most recipes where the wet ingredients and dry ingredients are mixed separately. I hate hand washing dishes, but I equally hate loading up my dishwasher with large bowls that take up so much space. And my dishwasher takes FOREVER to run a normal wash. 90 minutes. Is that normal? Every time I set it to a normal wash, I wonder just how much electricity I am wasting for what I’ve put in there. I like to make sure it’s REALLY full before I use that much electric. And, of course, as my ADD brain wanders, the next thought I had was: Whatever happened to sifting flour? I remember when I was young that mom always sifted the flour before using it. She said it was to make sure that all the little husks were removed and it wasn’t until I was grown that I learned one of the other reasons was to remove the little weevils whose eggs are present in the flour. Incidentally, it’s not only flour that those little buggers get into. I one time made a beef stew and used dried parsley flakes. After my kids and I finished one bowl and were going back for seconds, was when I saw the little creatures floating on the top. I never told my kids until they were older and now they’ve never forgotten that I fed them “weevil stew”. I made this recipe just at it reads, but when I make it again, I’ll make the following changes: I’ll omit the chocolate chips and add some type of dried fruit (or chopped Maraschino cherries), I’ll crush the frosted flakes before adding them and I wouldn’t refrigerate them for a full hour. My cookies spread very little after refrigerating them and I had to bake them for 12 minutes instead of the recommended 9-11. 1. Cream butter and sugars in the bowl of a stand mixer fitted with the paddle attachment. You can also use a hand mixer. Add oil and stir until smooth. Add egg and vanilla, mix until smooth, then stir in the salt and baking soda. 2. Mix in oats and flour until just mixed. Stir in chocolate chips and Frosted Flakes cereal. There is no need to crush the cereal; a stand mixer will do that for you. If you’re using a hand mixer, you may want to crush the cereal into large pieces before adding it to the cookie dough. 3. 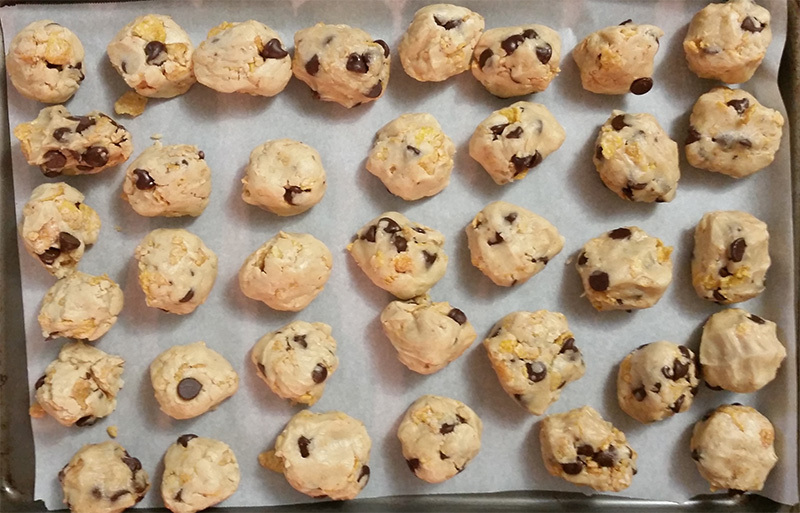 Scoop 2 tablespoon balls of cookie dough onto a cookie sheet covered in wax or parchment paper. No need to spread the balls out, you’re just going to chill them. 4. Preheat oven to 350°F. Line cookie sheets with parchment paper or silpat baking mats. Place cookies 2” apart on prepared cookie sheets. Bake for 9-11 minutes or until the bottoms just start to turn golden brown. Cool at least 5 minutes on cookie sheet before removing to rack to cool completely.